This section goes into detail about the design of your kit and provides some more information on how to flash new firmware onto your ESP. This isn't part of the assembly instructions of your kit, but may interesting to read for those of you who want to know more about this kit. 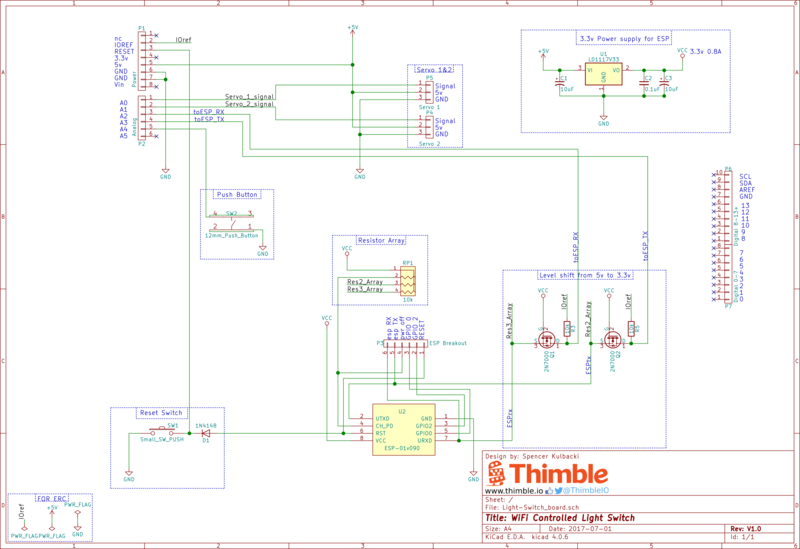 The circuit is fairly simple and uses only five of the Arduino's Analog data pins. Two servos can be are driven from pins A1 and A2 respectively, and the RX/TX lines for the ESP are on pins A2/A3. An Adruino's serial pins are accessible via digital pins 0 and 1, but using the SoftwareSerial library any pin on an Arduino can be used as an emulated serial pin. This is what allows the Arduino to communicate with the ESP using Serial data, but on pins A2 and A3. The LD1117 is a 3.3v regulator which can supply current up to 800mA. The three capacitors around it are what is recommended by the datasheet and serve to smooth the power input and output to a steady 3.3v. This is referred to as VCC in the schematic whereas the source voltage from the Arduino is labeled as +5v. The reason that the Arduino's 3.3v supply can't be used is because when transmitting the ESP will need up to 170mA of current; most Arduinos have 3.3v regulators that can only supply a maximum of 100mA. The larger package version (TO-200) of the LD1117 was used, even though it is somewhat overrated for this application, to avoid confusion between it and the two MOSFETS used for level shifting. Since nearly all TO-92 packages look identical, we figured that having all three parts look identical would only lead to mistakes when assembling the PCB. The ESP is a 3.3v device and therefore requires 3.3v serial data; the Arduino Uno can only send serial data at 5v. Connecting the two directly would eventually damage the ESP, so two 2N7000 MOSFETS were used. They were chosen because of their fast switching rate and ability to provide 400mA of current. They are the same model as the surface mount (SOT-23) level shifting MOSFETS found on the WiFi Robot kit. The 10kΩ pull up resistors (R3, R5) on the Arduino side pull up the line to 5v and limit the current when the Arduino takes the pin low. The 10kΩ resistor pack was used manly to show people one example of how combined components can simplify a circuit. In this case one connection to VCC is made and then the three pull up resistors only need one external connection to the circuit. The reset button functions as a reset switch for the Arduino and ESP. the 1n138 diode was chosen as a general purpose diode which can protect the ESP reset line from current spikes when pushing the button. The 12mm push button is used as a fallback toggle button for the light switch state. It can be pushed at any time to toggle the lights if for some reason the ESP stops working. It can also be repurposed to trigger more complex states if the user desires. The PCB features connections for two servos, this is in the case where someone wishes to use their kit to control a double switch plate. Standard 9g servos were used and mount into the PCB because they are fairly inexpensive but are still powerful enough to toggle switches. You don't have to do this to use your ESP, it comes flashed with the correct firmware to use with your Light Switch Kit. This file includes the necessary programs, binaries, and instructions in order to flash new firmware to the ESP 8266. The ESP is "not" 5v tolerant, but many people have been treating it as though it is and have been fine. This is my warning that using a 5v programmer can damage it so be careful! When the ESP is powered on while GPIO0 is tied to ground it will start in flash mode and allow you to program it. Make sure the SpiAutoSet this will allow the programmer to read your ESP for the correct flash, clock, and device id and set the programming settings accordingly. Leave all the Download Path Config boxes unchecked and empty. Click start in the bottom right and you should see the DETECTED INFO box populate with your ESP's information as well as the MAC address in the bottom window. This information is also seen in the terminal window that opens with the program. For an ESP matching the settings shown in the settings image, we have already created a combined Binary .bin to be used. Click the ... to the right of the first box at the top of the program and select the CombinedFiles.bin file from the same folder this readme is in. Click the checkbox on the left and you should see both boxes on that line turn green. If so that means you are all set. If not, then you may have not properly selected the .bin file or it has been moved to a different location since you selected it. With you ESP and FTDI chip still powered on and connected from the steps above, click the START button and you should see the progress shown in the terminal window. Once the progress reaches 100% your ESP is now programmed. The last thing to do is test and set the baud rate of your ESP to work with an Arduino. To verify you can use the ESP_AT_Test.ino to test the AT commands with your ESP. Included in the \bin folder is a set of binaries for various specifications of ESP8266s. This can be downloaded from the Espressif site by searching ESP8266 Firmware SDK online. With these files selected as in the settings.png image, clicking the START button will program your ESP. You can also use the CombineBin button to generate a single bin file using the files and offsets above. That is how we made the CombinedFiles.bin from earlier. If the programmer is not recognizing your ESP make sure that GPIO0 is connected to ground BEFORE you power it on. Most times (if it's wired correctly) unplugging the whole setup from your computer's USB port and plugging it back in is enough to reset the ESP back into Flashing mode.